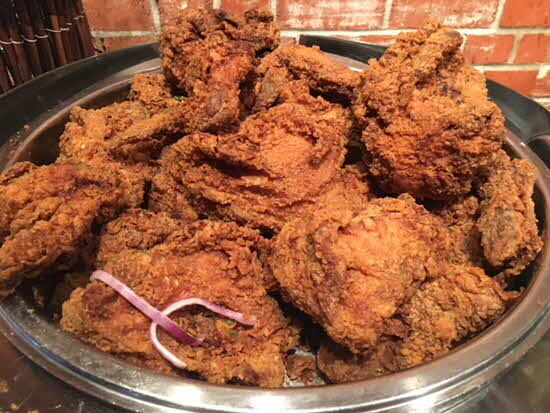 The area in and around Lafayette is the indisputable center of all things Cajun and Creole: from pork chop sandwiches to beef jerky, boudin balls, specialty sausages, cracklin, smoked meats, curried and stuffed chicken, chili dogs, crawfish boils, plump fried oysters and other regional specialties. My recent visit cleared my culinary confusion. I discovered the words Cajun and Creole are not interchangeable, even where food is involved. Many Cajun and Creole dishes are based on a roux and use some of the same ingredients such as cayenne pepper, okra, sweet potatoes, squash, beans, corn and sassafras (bottled as filé, a topping for gumbo). Boudin is a combination of cooked rice, pork, onions, green peppers and seasonings pulverized and stuffed into a sausage casing. and then steamed. Everyone has a favorite boudin recipe, many handed down for generations. However, differences do exist between the two types of cuisines. The word Creole has many meanings, but here it implies a cultural mix of West-European, African, Caribbean and native Indian. To most south Louisiana blacks, Creoles are of a multiracial heritage with African and Caribbean roots. These Creoles have produced zydeco music and a distinctive cuisine with ties to Acadiana, New Orleans and the American Southeast. Many regional African-Creole traditions were preserved by black Louisianans with a variety of "iron-pot" delicacies - greens cooked with fatback, Caribbean-style cowpeas and rice, gumbos with pork sausage, chicken giblets and seafood, and a host of stews … forming a style of cooking, using the humblest ingredients and resulting in the richest flavors. Creole cuisine got its start in the early 1700s in New Orleans and eventually found its way along the bayous of South Louisiana. In the 1790s, thousands of French colonists fled Santo Domingo (present-day Haiti) for New Orleans to escape the terrors of the slave rebellion led by L'Ouverture. The refugees strongly influenced local cuisine by bringing their distinctive Caribbean spice combinations and cooking techniques. Around the same time as the Caribbean refugees were arriving, the French Acadians who were expelled from Acadie (present-day Nova Scotia, Canada) arrived in South Louisiana. Settling in remote areas away from New Orleans, this geographic and cultural isolation led to the development of a distinctive cuisine. The Acadians were farmers, so their early cuisine was based on corn, rice, root vegetables, chicken and pigs. The bayous and wetlands along which they lived provided an abundance of rabbits, turtles, finfish, shellfish, ducks and geese. The Acadians learned to use corn from the local Indians, stewing it with sweet peppers, onions and eventually tomatoes to create maque-chou. They also dried the corn, ground it and cooked it in a skillet to make coush-coush, a traditional breakfast food. The area's African-descended inhabitants contributed okra for use as a vegetable or to add to gumbo. Several other cultural groups contributed to the culinary melting pot of South Louisiana. The cooks for English, Scottish and Irish plantation owners used what was grown and raised on the plantation as well as delicacies that arrived at the port of New Orleans from the Caribbean and Europe. St. Martinville and other towns near Lafayette had French settlers who arrived from France or the French West Indies. The French Press, located in the old Tribune Printing Plant, is open for breakfast, lunch and special events. Many original details have been preserved, including the floor, door and water system. Chef/owner Justin Girouard’s culinary career began at Stella's in NOLA; he went on to study in France and returned to Lafayette to open French Press in December 2009. Nominated for a James Beard Award in 2011-2015 for chef of the South, his creative enticing menu made it difficult for me to settle on one dish. 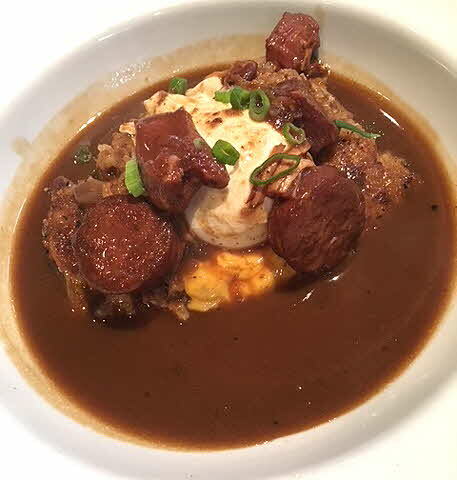 Sharing was the answer: Cajun Benedict: made with crunchy toasted French bread, Herbert's boudin, American cheese and two poached medium eggs was topped with chicken, andouille gumbo and fresh scallions. The Corn, Crab and Crawfish Benedict: two corn maque choux crab and crawfish cakes with Canadian bacon, two poached eggs and hollandaise was served with a choice of breakfast potatoes or cheddar grit; mini pancakes: filled with bacon, a fresh boudin ball and sweet cane syrup were also served with potatoes or grits.The lunch menu challenged my appetite, especially the meatloaf sandwich served with fresh tomatoes, onions, arugula, sun dried tomato mayo and melted swiss on toasted 12 grain. 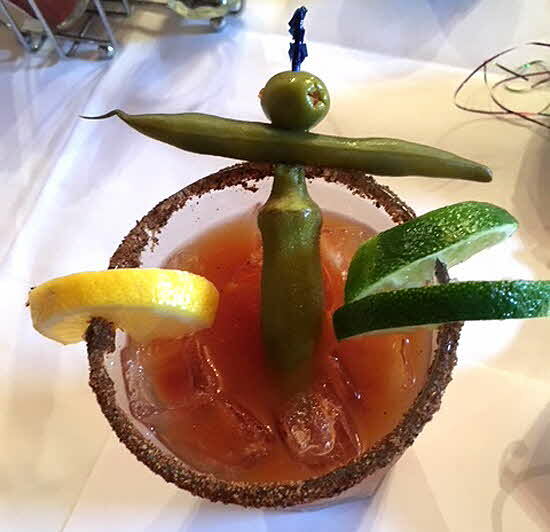 Zydeco Breakfast at Abacas Restaurant, delivered several gastronomic surprises, including a “make your own Bloody Mary Bar”. 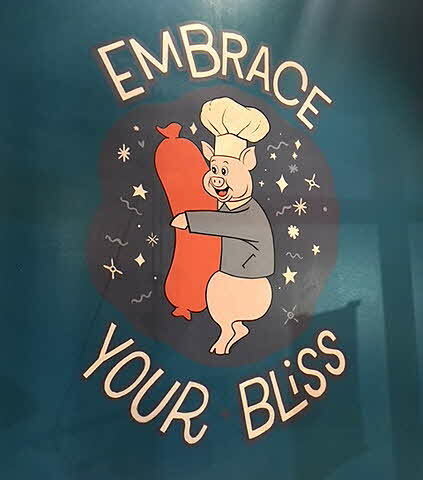 Owner Robert Fruge, a hands-on entrepreneur, and a true Southern gentleman, grew up on a horse farm, went to law school and then decided it was more fun to socialize with customers that stand before a judge. His portfolio of restaurants and special event catering venues reflects his charming, warm and winning personality. My compliments to Chef Joe Lewis for the best beer battered fried chicken I've ever eaten … and an exceptional buffet of local dishes that included: shrimp scampi over angel hair, stuffed pork roast, smothered turnip tasso & peas, back of the Bayou Gumbo and his signature sweet potato cane syrup bread pudding with raspberry sauce. Dat Dog, a colorful bar with locations around the city and live music a few nights a week, has their own modern take on Cajun and Creole fixins. 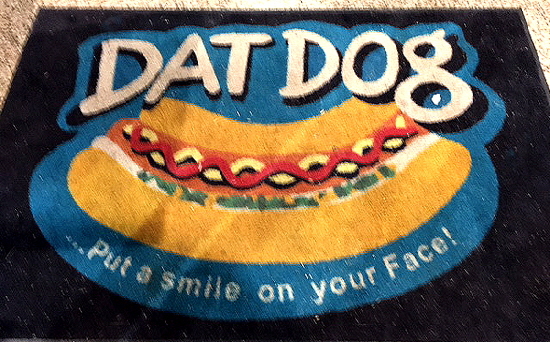 Their bizarrely creative and colorful menu of Haute Dogs House Specials, Dat Burgers and Dat Chicks put a smile on my face, as the menu promised. They serve a wide variety of sausages, including traditional German, alligator, duck and vegan … with a choice of 31 toppings: their crawfish etouffee dog, made with crawfish sausage is served with sour cream, onions, tomatoes and creole mustard; the Guinness Special, Irish Guinness sausage was served with andouille sauce, onions, cheese, bacon and yellow mustard. There’s even “the son of a saint dog”: hot sausage, andouille sauce, grilled onions, tomatoes, “chick” sauce and & creole mustard. Blue Dog Café, another popular local restaurant, serves Cajun cuisine and Louisiana fusion. 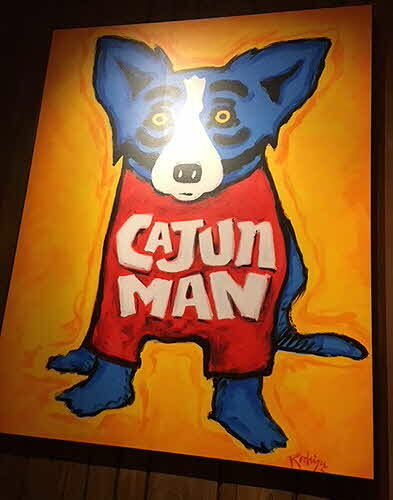 Artist, and one- time partner, George Rodrigue’s Internationally acclaimed and compelling “Blue Dog” paintings stare out longingly from the walls and behind the bar. Since George’s death, son Eric runs the restaurant. You may also want to pop into The Blue Dog Gallery. Olde Tyme Grocery, a favorite with locals, gave us a taste of the Murphree family’s “Best Po Boys in town”. It was fascinating to watch their unique shrimp machine butterfly the dozens of pounds of shrimp they serve daily. Later that evening, Don’s Downtown, a seafood and steakhouse, one of Louisiana’s original Cajun Restaurants, established in 1934, served up platters of crawfish, fried oysters and crab cakes, made from original family recipes. Thanks to the preservation of local traditions, and the creative talents of young Internationally trained chefs, Cajun and Creole Cuisines continue to evolve, and even merge, into what might be called "South Louisiana cuisine.". Not-to-be-missed: The Festival Acadiens et Creoles, the 2nd weekend in October, celebrating the food, music and culture of the Cajuns and Creoles of South Louisiana. 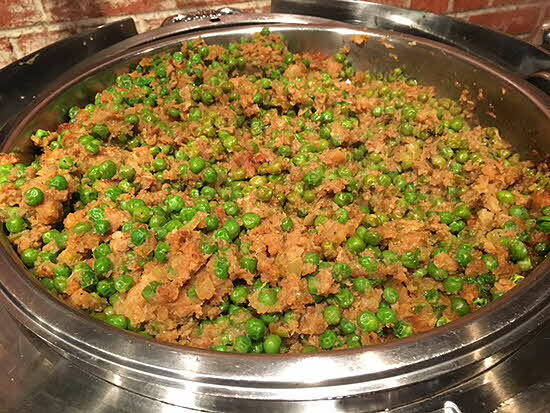 And if you can’t make this, the Annual Boudin Cook-Off, also in October, brings top boudiniers together to show off their skills. There’s no doubt about it, Lafayette Louisiana has mastered the art of “stirring the culinary pot”. © May 2018 LuxuryWeb Magazine. All rights reserved.